Would you believe me if I told you this delicious, hearty warm bowl of oatmeal is gluten free, dairy free, sugar free AND packed with super foods?! 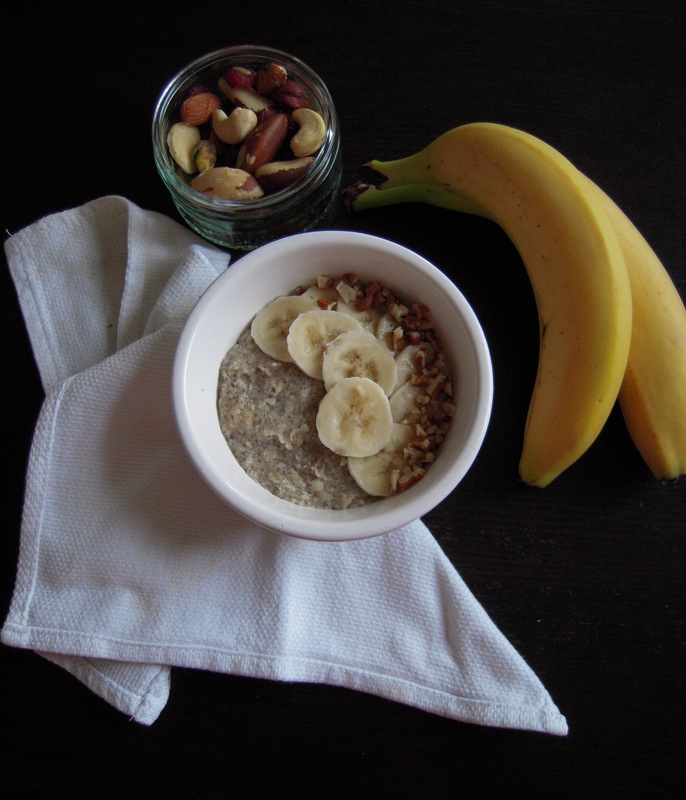 If you’ve been reading my How To Eat Healthily During Exams series, found here, here, here and here, you may have seen the banana bread oatmeal recipe, so I thought I’d do a post on it! 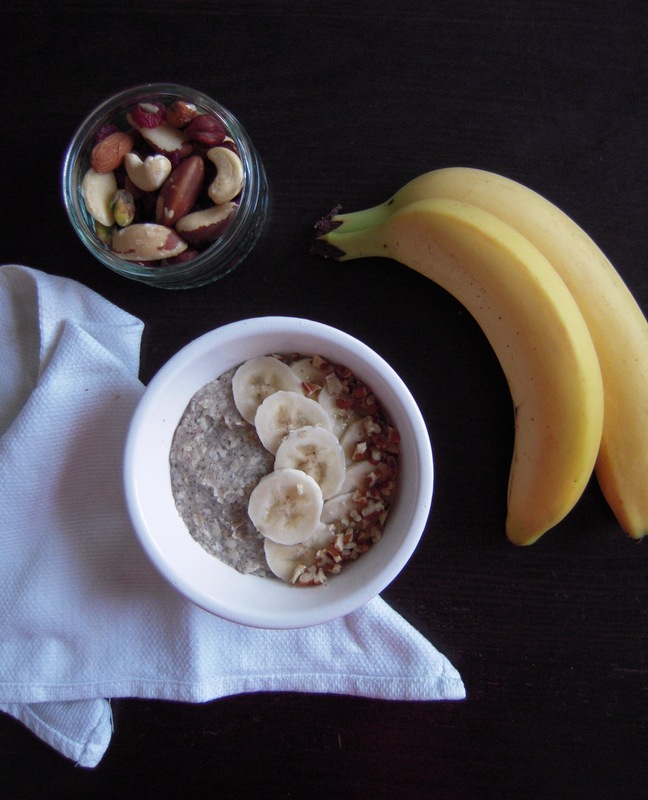 This breakfast is just a superhero – Its so delicious and is so good for you! The chia seeds are packed with protein and fibre so keep you feeling full for ages and you can easily get a portion of fruit into it. note: feel free to use any sweetener, but I feel its sweet enough if I use a ripe banana. Put oats in a sauce pan with water just covering it and leave it for 10-15 minutes with a lid on so it soaks up the liquid. While this is happening, mash 1/4 of the banana and slice the other quarter into slices. One the oats have soaked up the liquid, put in the cinnamon, mashed banana and chia seeds. Cook on low for about 5 minutes until chia seeds soak up the water and the oatmeal increases in volume. Once it is done, serve it up in a bowl and top with banana slices and nuts. Add any sweetener if liked. 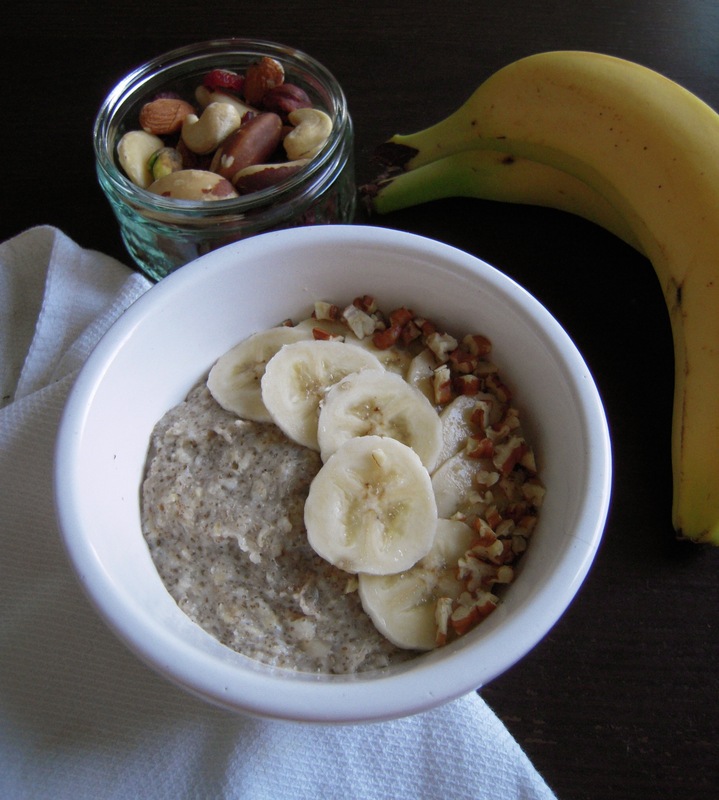 I love banana bread and oatmeal! You mix both together: Best breakfast ever!! Thanks for the inspiration! Thanks for stopping by 🙂 it tastes great with blueberries in it too! Not my type of breakfast but nephews really wants oatmeal during breakfast. They’re my next- door neighbors and I’m the one preparing their breakfast since their mom can’t do such. I think I will give it a try tomorrow. Think they’ll love this. I checked my email just this morning and read your reply. I served them the recipe and yes, they liked it. They even asked for more. 🙂 Their 3- year sister even asked me to teach her to cook oatmeal. What I did is just show her the laptop and made her play the oatmeal cooking game though its cookies. See this: http://www.y8.com/games/fantastic_chef_oatmeal_raisin_cookies. See? This is so unique and looks delicious. I have to give this recipe a try. Thanks Cathleen!! I love spicing it up a bit with some banana or other fruits – it also tastes great with prunes or dates for natural sweetness!